THERE are many impediments to opening a restaurant: risk of bankruptcy, relentless working hours and the lingering smell of cooking fat in one's clothes, for starters. Certain death, though, would have to be the most compelling reason to leave this career path well alone. 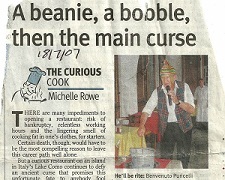 But a curious restaurant on an island in Italy's Lake Como continues to defy an ancient curse that promises this unfortunate fate to anybody fool enough to pitch up there, safe in the knowledge that a ritual involving a bell, a bubbling pot and a man sporting a bobble hat and tartan waistcoat will see it through the worst of times. And, oddly enough, so it has. Since 1947, Locanda dell'Isola Comacina, which sits alone on the tiny island of Comacina, a stone's throw from the northern Italian village of Menaggio, has attracted a glittering clientele, including the likes of Elton John, Sean Connery, Stella McCartney, Kim Novak and Brad Pitt. And it hasn't lost a punter so far. According to legend, the bishop of Como cursed Comacina in 1169 when, in a breathtakingly ill-advised piece of bravado, this speck of an island declared war on the mainland. Subsequent inhabitants (the few silly enough to chance their luck here; the restaurant is still the only business operating on these shores) have been trying to exorcise the place since. Two early backers of the locanda, it is said, died premature deaths. The third, former owner Lino Nessi, was about to cut his losses and leave when he was said to have been told by an English writer by the name of Francis Dale that the key to unlocking the terrible curse was a ritual of fire. Dale was on to something. The fire business, in a stroke of luck for Nessi, seemed to do the trick. In 1976, the by then successful restaurant was sold to Benvenuto Puricelli, a rather eccentric host who carried on where Nessi left off. At the end of every meal, Puricelli dons a beanie with a bobble on top and, at the sound of a bell, burns a pot of brandy before adding sugar and coffee and serving it to guests. This constitutes the "exorcism of fire" that is responsible for seeing guests home safely after. Our small party of diners is game for a risk. After stepping off a shuttle boat -- the restaurant is accessible only by water -- we file past a gallery of celebrity photographs on the wall just inside the locanda's front door (most of which include a grinning Puricelli with an arm around a famous guest) and take our seats in the dining room. The interiors are surprisingly low-key and almost daggy, sort of like a Swiss chalet. But the views through the picture windows are what counts. Lake Como spreads before us, the mainland framing the exquisite waterway. This surely is one of the most beautiful locations in the world for a restaurant, curse notwithstanding. As Puricelli talks our group through what is to follow, we discover that another tradition he has continued is the menu, which remains unchanged from the day the restaurant first opened its doors more than 60 years ago. Like Brad and George and Elton and Sylvester before us, we are treated to a six-course extravaganza involving simple yet exquisite plates of the freshest produce. Our antipasto first course comprises sliced tomato with lemon, salt, oil and oregano, followed by eight fresh vegetables: celery, carrots, baked onions, sweet peppers, zucchini, beans, broccoli and French beans, prepared without fuss or fanfare but providing an explosion of flavour. A separate plate of prosciutto and bresaola complements the vegetables. "Friendly bread", a loaf from which a piece is torn by each diner, is passed around at the same time. The second course is fresh trout grilled over charcoal, while the third heralds fried free-range chicken and salad. Servings, on large platters, are plentiful and we tuck in with gusto. Just when thoughts turn uneasily to unexpected coronary issues, Puricelli arrives with a huge wedge of parmesan cheese, from which he cuts chunks and hands them to each of his guests. Dessert follows: sliced oranges and ice cream with a sweet, creamy topping. At a cost of E60 ($107) a head, including wine, it's a good deal in anybody's language. But we're not finished yet. It's time for the famous exorcism of fire. It's hard not to stifle a giggle as our exuberant host arrives with bobble hat fixed firmly in place, clutching a copper pot of brandy. He theatrically sets it alight while explaining the legend of the curse and how this fire ceremony is said to ward off danger to all who visit the island. That this odd little event results in a jolly nice liqueur coffee at the end of a most enjoyable meal is just a happy coincidence, it seems.